I love learning about international cultural holidays, and I especially love learning about the foods associated with the holidays. For the past few years I’ve been celebrating Chinese New Year, preparing a dinner of intriguing traditional recipes new to me, including care package ready cookies for dessert! I’ve enjoyed Peanut Cookies and Pineapple Cookies. This year I created my own version of Butter Cookie Dragons. It’s fascinating to me that there are many cultures with similar cookies. How did that happen? Ancient travelers? Brilliant minds think alike? 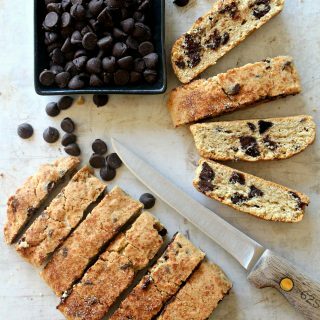 Creative use of available ingredients? Sablés, Viennese Swirls, Danish Butter Cookies, Petibör, and Chinese Butter Cookie Dragons are all made with strikingly similar recipes. 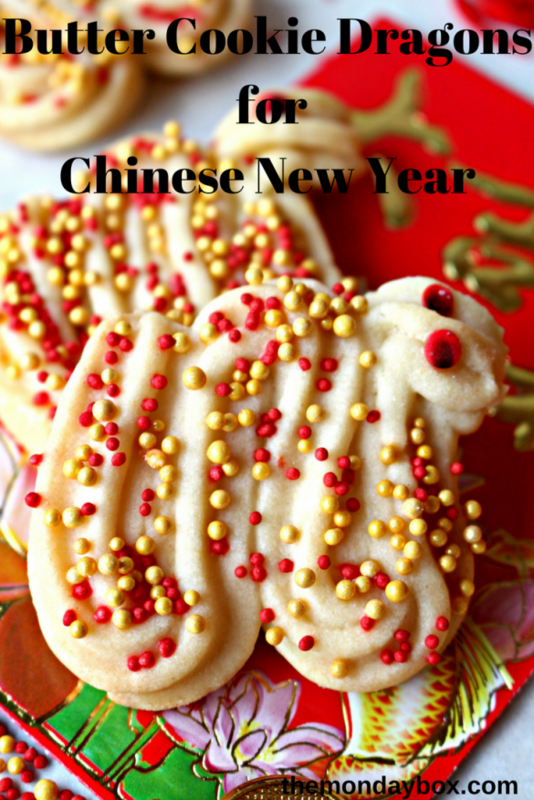 The basic dough for the Butter Cookie Dragons and the swirly dragon shape are true to the traditional Dragon Cookie popular in many countries where the Lunar New Year is celebrated. I found recipes originating in China, Singapore, and Malaysia. The recipes were all very similar, with almost identical ingredients. The only difference was the slight variations in the ratios of flour, sugar, butter, and corn starch. I experimented until I found a combination I liked best. If you bake these cookies and ignore my directions for icing and sprinkles, you will have a traditional New Year Dragon Cookie. I added icing and sprinkles which isn’t culturally accurate, but it certainly is festive! The flour used in a recipe has a huge impact on the texture of the finished product. The gluten content in all-purpose flour varies from brand to brand depending on the wheat used. 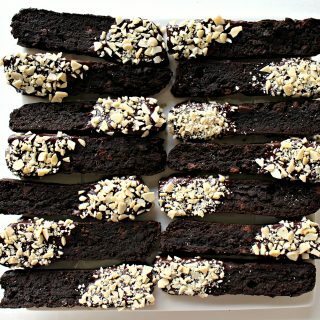 Certainly, the gluten content varies from nation to nation. 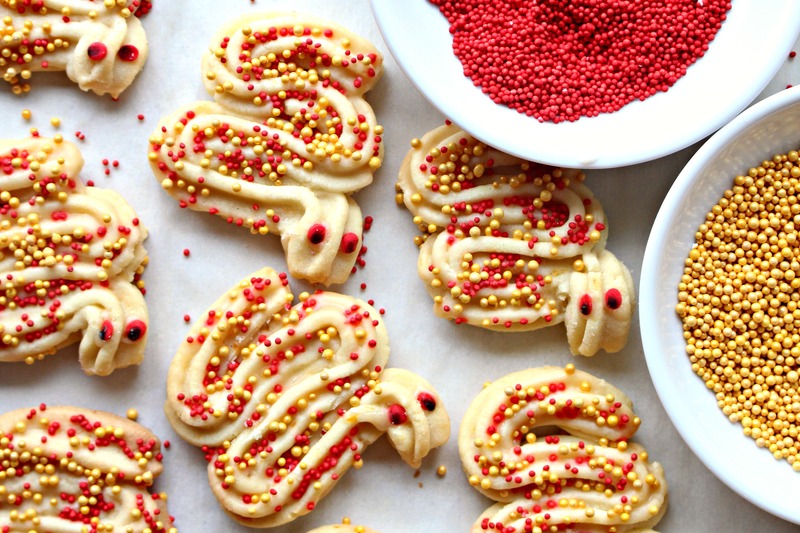 Butter Cookie Dragons are meant to be a crisp cookie that melts in your mouth. A balance of flour and corn starch (plus using confectioners’ sugar rather than granulated sugar) provides the wonderful texture without a sandy feel. I played with ingredient quantities until my American ingredients produced the texture I was looking for. Generally, Asian cookies are less sweet than American cookies. The original recipes all produced cookies that varied from barely sweetened to not sweet at all. Though my version of Butter Cookie Dragons is not overly sweet, I both double the usual amount of confectioners’ sugar and use a light confectioners’ sugar glaze for a sweetness that is appealing and familiar to most North American tastes. The dough for Butter Cookie Dragons is stiff. The stiffness is necessary for the piped ridges to remain intact while baking. However, after piping a few cookies my hands and arms were sore! Perhaps this is an indication I need to work out more. 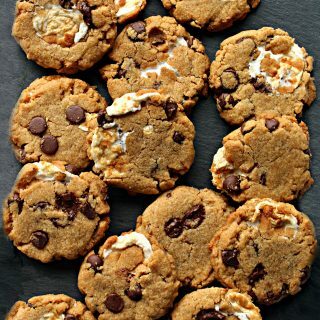 In Jamie Oliver’s recipe for Dragon Cookies he writes, “You’ll need a good strong piping bag, a supersized star-shaped nozzle, and biceps of steel!” Not having biceps of steel, shouldn’t keep you from making these tasty treats. I found that adding just 2 teaspoons of milk to the dough made piping much easier without effecting the dragons’ textured look. Instant milk powder is not a flavoring ingredient often used in American cookie recipes. Powdered milk is used in this recipe, not as a flavor that stands out on its own, but to add fullness to the other flavors in the cookie. 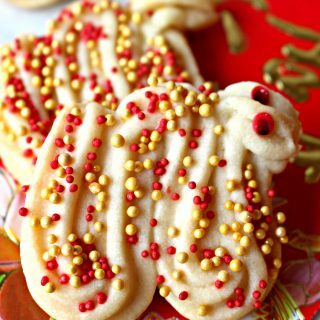 The powdered milk can be left out, but the Butter Cookie Dragons won’t have the same rich flavor. 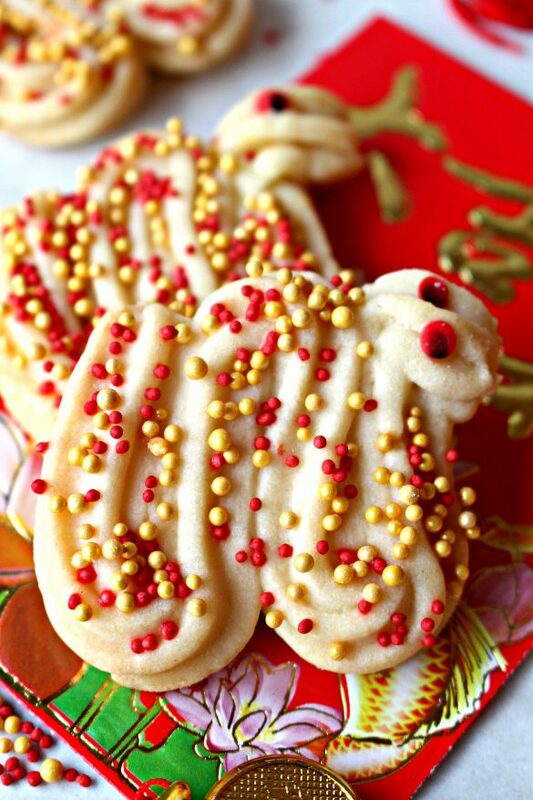 Vanilla extract is traditionally the only flavoring added to Butter Cookie Dragons. 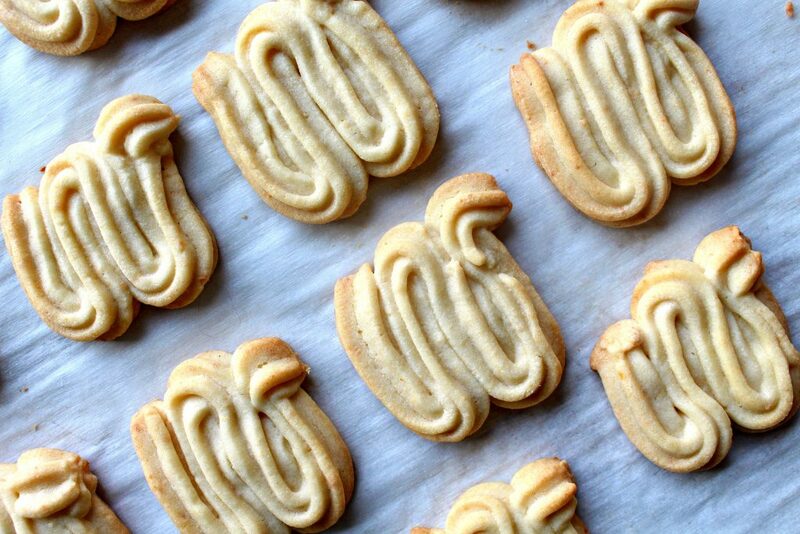 The addition of orange zest is an idea I got from my favorite recipe for Viennese swirls. I include orange zest as an optional ingredient. Not only is the zest delicious, but it’s fun to note that oranges and tangerines are considered auspicious symbols for wealth and luck in the New Year. A note about decorating: As I mentioned, traditional Butter Cookie Dragons are undecorated. Eyes are often added using a toothpick dipped in food coloring, but the cookies are left otherwise plain. Because I love sprinkles and the festiveness they bring to baked goods, I added nonpareil sprinkles using a confectioners’ sugar glaze as glue. The red and gold colors are further symbols of prosperity and good luck. The confetti sprinkle eyes may just be symbolic of my insanity, but they took so little time to make (less than 10 minutes) that I couldn’t resist. A simple dot using an edible marker, makes all the difference. Should you not share my particular brand of sprinkle insanity, eyes can be added with plain black or red confetti sprinkles, purchased candy eyes, or in the traditional manner by dotting on a bit of food coloring. In a medium mixing bowl, whisk together flour, corn starch, and milk powder. Set aside. Add the egg yolk, vanilla, and orange zest, then beat to combine. Mix in flour mixture just until dough forms. Add up to 2 teaspoons of milk to create a dough soft enough for piping, but firm enough to hold it’s shape in the oven. If you are unsure of how much milk to add, try piping some of the dough and adding until the desired consistency. The dough is easiest to pipe using a quarter of the dough at a time. Place about ¼ of the dough in a piping bag fitted with a star tip. Pipe the dough onto the prepared baking sheet in a rounded “W” shape with a small extended of dough at the end for the dragon’s head. 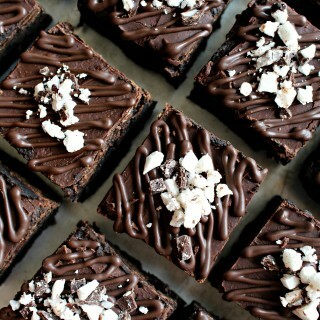 Bake for 10-12 minutes until the bottom edges just begin to brown. Remove from the oven and cool on the baking sheet for about 5 minutes before transferring to a wire rack to cool completely. To make dragon eyes, draw a dot on each red confetti sprinkle with an edible marker. For less detailed eyes, skip this step and use plain red or black confetti sprinkles instead. In a small bowl combine the icing ingredients and stir until smooth. Working with one cookie at a time, use a small food brush to paint the icing onto the cookie everywhere but the dragon’s head. Sprinkle with red and gold nonpareil sprinkles. Paint an icing dot where you want to glue on the dragon eyes, and add the prepared red confetti sprinkle eyes. Allow the icing to dry completely (about 1 hour) before storing in an airtight container at room temperature for up to 2 weeks. Though long lasting, Butter Cookie Dragons require careful packaging due to their shape. Keeping the cookies from moving in a protective container is key. Wrap pairs of cookies, bottoms together, in plastic wrap. Place the bundles snugly in an airtight container padded on the top, bottom, and sides with wrinkled wax paper. Gently shake the container before packing to be sure there is no movement. Pack the container toward the middle of the shipping box. These are adorable Wendy. Such a great idea and I like your adaptations. I’m certain I’d like yours (with the double sugar) more than the original recipe. These cookies are so adorable and sound delicious. I love the addition of orange zest. Thanks, Shannon! I have a bit of a sprinkle addiction 😉 But I thought the occasion called for some bling! Thanks, Shannon! I find that orange zest is an especially welcome, bright flavor in the winter. These are really cute for the Chinese New Year. 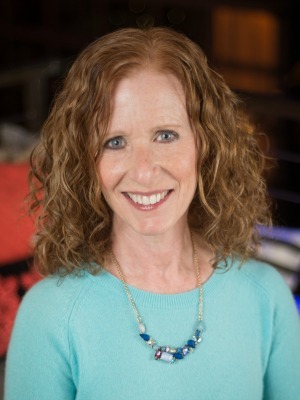 Thank you for sharing at Funtastic Friday Blog Hop. You are the most creative and talented baker ever! These are fantastic and just the ticket for Chinese New Year! Good luck to you too! Thank, you for your incredibly kind enthusiasm, Tricia! I don’t know about talented, but I definitely enjoy playing in frosting and sprinkles! Love this idea for Chinese New Year! Pinning for the next year of the Dragon! Thanks for linking up with Funtastic Friday! 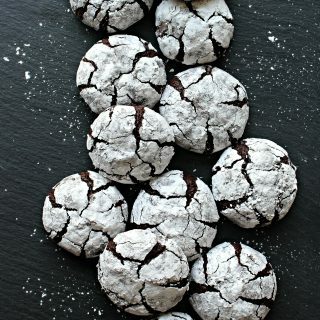 Would these cookies work in a cookie press like a spritz? Thank you for your reply. I love the cookies in the blue tin…(shortbread type butter cookies) and want to get as close to that texture/taste as possible and haven’t been able to get it right. I had pinned the cake mix press cookies as well but wasn’t sure of the texture of those. Insight or input? Thanks! If I remember correctly, the butter cookies in the blue tin are crunchy with a distinct butter taste. The cake mix recipe, has a slightly less crunchy bite, a little more “melt in your mouth” than crunchy. 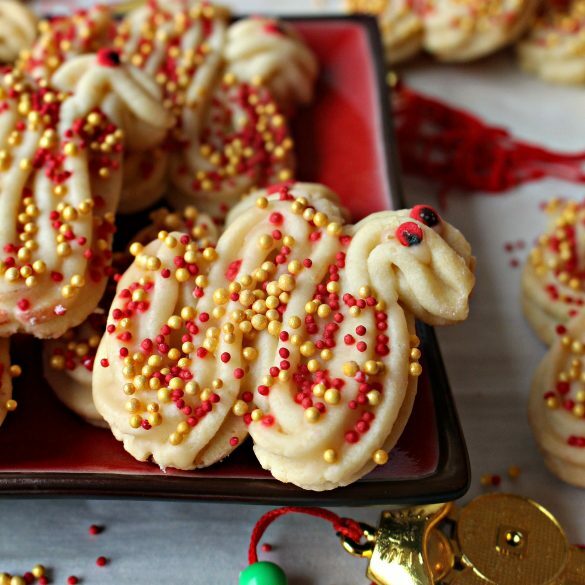 I think the butter cookie dragon recipe is closer to what you are looking for. Be sure to use a high quality European-style butter (Kerrygold, Plugra, etc.). In a cookie where the butter flavor is the main flavor, it really worth spending a little more for a butter with great flavor. Good luck! Let me know how your experiment works out! Hi. I just found your site and it is fantastic! I love it because it has something for everyone. 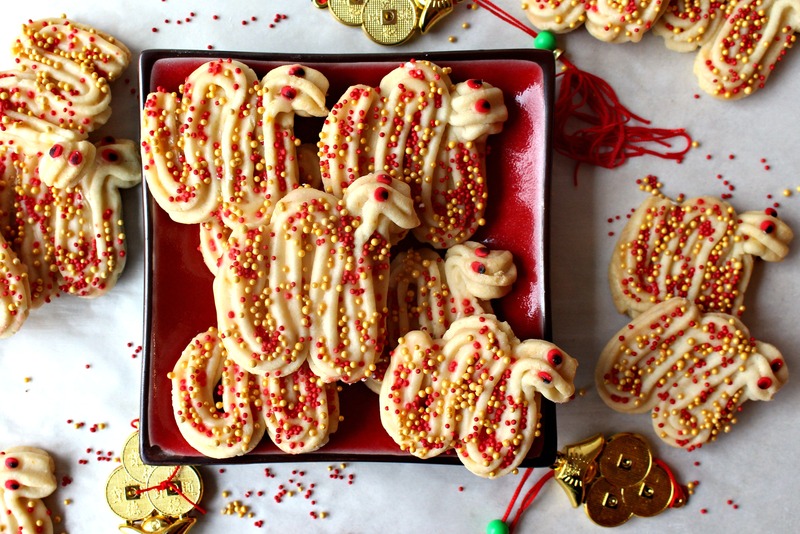 I am obsessed with the sprinkle used on the Butter Cookie Dragons for Chinese New Year and was hoping you would share where you purchased them. Thank you so much. I want to use these cookies for kids. I have never seen gold nonpareil sprinkles or this shade of red. It makes these cookies so festive. Thanks again and congrats on such a wonderful site. Thank you so much, Candice! I am delighted that you found Monday Box recipes that intrigue you. 🙂 I am obsessed with sprinkles in general (!) 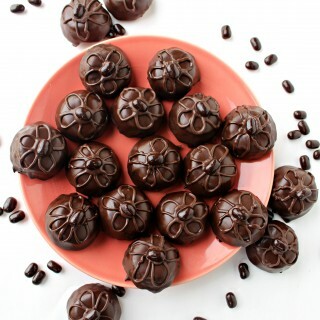 and would be glad to help you with these.The gold nonpareils come from World Market. They have only a few decorating supplies in their baking section but they are all a deal! The 2.6 oz bottle of “Mini Metallic Beads- Gold” by the brand Twinkle were $1.99 I used less than half of the bottle when making the dragons. I am not positive about the red nonpareils, but I probably made them myself. Did you know that you can color white nonpareils yourself?! Game changer. Pour white nonpareils into a small ziplock bag, add a drop or two of GEL food coloring (I prefer the brand Americolor), close the bag and smoosh together the coloring and sprinkles until they are evenly colored. Open the bag and allow the sprinkles to dry for about an hour. They may clump a bit, but when they are dry you can smoosh the bag to get rid of clumps. I probably used the color, “Super Red ” Have fun! Thank you so much for getting back with me and for giving me very useful information on coloring the white nonpareils. We live in a rural area but I can find white nonpareils at Walmart and great to know I am not limited to just a few colors. Once again thank you and I will be visiting your site often. Glad I could help, Candice! I hope you and the kids enjoy the cookies! It is amazing that so many cultures share the same cookie shape! Your Butter Cookie Dragons are lovely Wendy, and . a fun (and delicious) way to celebrate Chinese New Year. Thank you for sharing, and for being a part of the Hearth and Soul Link Party. Sharing this post on the H&S Facebook page later today. Hope you have a lovely week!